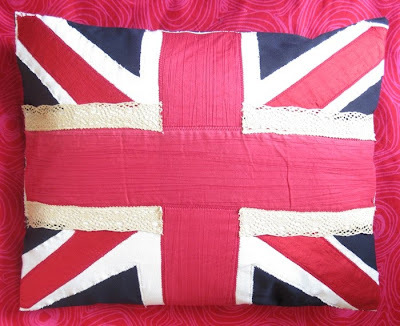 This is the union jack cushion I made a couple of weeks ago - using a combination of new and vintage fabrics and materials, silk, calico, lace, all sorts! The one I'd made before was on a square cushion, but I do think it looks much better on a rectangle, and it has a lovely goose feather cushion pad inside from John Lewis. Inspired by Viv, created by me!